IS (RCI) QSL card. These cards were issued by shortwave services to listeners around the world to confirm the details of the broadcasts they heard. 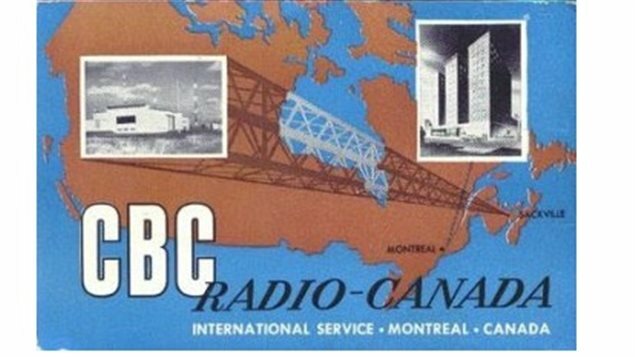 Beginning in 1945 the CBC International Service (now Radio Canada International) beamed radio abroad. Its programming has reflected “Canadian foreign policy commitments and interests.” Initially focused on Eastern Bloc countries, the International Service was part of “the psychological war against communism”, according to external minister Lester Pearson. But, the “Voice of Canada” also produced programs for Latin American, African and Caribbean countries. External Affairs had close ties to CBC International Service. Early on the department was given a copy of the scripts used by commentators and its funding came directly from External Affairs into the 1990s. The renamed Radio Canada International (RCI) has always consulted with Foreign Affairs to determine broadcast languages. To fill a mid-1990s budget hole, RCI received $6 million from Foreign Affairs, $6 million from Canadian Heritage and $4 million from CIDA and DND combined. Down from its high point, between 2000 and 2012 Ottawa spent about $12 million annually on RCI.